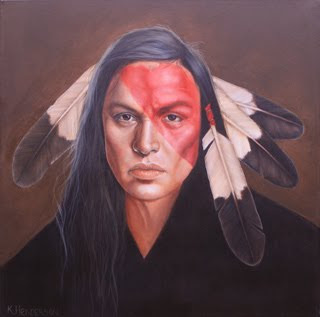 I'm pleased to announce that all participating artists in Gallery 822's annual Indian Market show enjoyed success. Large crowds attended the openings and art work was sold. 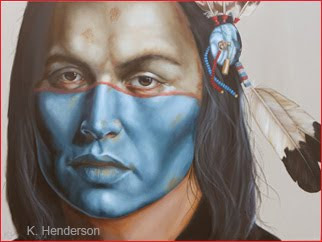 If you will be in Santa Fe for Indian Market next weekend, please be sure and stop by The Gallery at 822 on Canyon Road. All 14 of the gallery's artists will have new work. Most of them will be at the Artists Reception on Friday, Aug 20 5pm - 8pm. Stop by and say hello. Since 1901, 30 x 40, oil on linen. I really enjoyed creating the painting 'Indian' based on the logo for the Indian Motorcycle, so I painted this second, larger one. 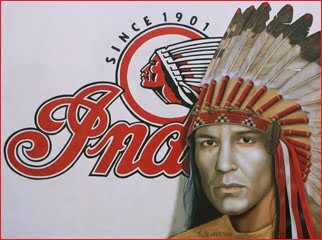 This one shows an American Indian wearing a feathered headdress as the Indian in the logo. American Indian prophet, Wovoka, began the Ghost Dance religion in an attempt to bring peace between the Indians and the Whites. It brought together element of Paiute, Christian, Shaker and Mormon religions. From the latter, Wavoka made use of the Mormon Endowment Robe, a robe "emblazoned with sacred symbols… reputed to protect the wearer from Satan and physical harm"
The Ghost Shirt is painted with symbols as a prayer to ask for natures help in restoring Peace and Abundance. The shirt was also said to protect the wearer from bullets.